Graffiti on the separation wall in the West Bank, Palestine. Photo by Wall in Palestine. Flickr.com (CC BY-SA 2.0) Some rights reserved.The Palestinian Authority’s (PA) arrest of West Bank human rights defender Issa Amro for a Facebook post last month is the latest in the the PA’s recent crackdown on online dissent among Palestinians. Yet it’s a tactic long used by Israel, which has been monitoring social media activity and arresting Palestinians for their speech for years – and has recently created a computer algorithm to aid in such oppression. Since 2015, Israel has detained around 800 Palestinians because of content they wrote or shared online, mainly posts that are critical of Israel’s repressive policies or share the reality of Israeli violence against Palestinians. In the majority of these cases, those detained did not commit any attack; mere suspicion was enough for their arrest. The poet Dareen Tatour, for instance, was arrested on October 2015 for publishing a poem about resistance to Israel’s 50-year-old military rule on her Facebook page. She spent time in jail and has been under house arrest for over a year and a half. Civil rights groups and individuals in Israel, the Occupied Palestinian Territory (OPT), and abroad have criticized Israel’s detention of Tatour and other Palestinian internet users as violations of civil and human rights. Predictive policing, which uses data analytics and algorithms to forecast where and when a crime might occur, is nothing new. Fifty police departments in the US already use one form of predictive policing: area mapping of so-called hotspots on which police then focus their efforts. In contrast, Israel uses predictive policing to identify likely attackers. In the US, a coalition of civil rights organizations, including the ACLU and the NAACP, criticizes the use of algorithms because they reinforce existing police bias and discrimination against minorities and other oft-targeted groups. Essentially, predictive policing uses past data related not to actual crimes or attacks, but to the state or police response to it. For example, when researchers applied predictive policing algorithms to drug crime data in Oakland, California, the algorithm recommended police be deployed exclusively to neighborhoods with low-income black residents. Oakland police were already patrolling these areas heavily for drug crime. Thus, such algorithm-based systems only reinforce existing biases. “[Predictive policing] concentrates existing law enforcement tactics, and will intensify stringent enforcement in communities of color that already face disproportionate law enforcement scrutiny,” the coalition said in a statement. While systematically targeting Palestinians online, Israel does not punish its Jewish residents for their social media posts, though a significant number of them are racist and violent toward Arabs or Palestinians. A recent report from the Palestinian organization 7amleh reveals that in 2016 almost 60,000 Israeli internet users wrote at least one post containing either racism or hatred towards these groups, mostly on Facebook. This translated into a violent post every 46 seconds. The difference in how the Israeli government treats Palestinians and Jewish Israelis in regard to their online speech is emblematic of how it treats them in real life. The difference in how the Israeli government treats Palestinians and Jewish Israelis in regard to their online speech is emblematic of how it treats them in real life. Israel severely restricts Palestinians’ freedom of movement through checkpoints and the massive West Bank separation wall in an attempt to control an oppressed people struggling for its freedom. Jewish Israelis, on the other hand, are permitted unfettered freedom of movement, both in Israel and most of the OPT. Israel justifies its mining of online data by boasting that doing so has decreased the number of violent attacks. The argument is similar to other authoritarian governments that justify online surveillance, internet shutdowns, the blocking of websites, and censorship. Even if such algorithms deter attacks, imprisoning Palestinians based on a probability created by a machine is a clear violation of Palestinians’ rights. The expansion of the Israeli occupation’s oppression of the Palestinian people, now in its fiftieth year, to the cyber sphere is an alarming trend. Every and any Palestinian is now a suspect simply by exercising their freedom of expression online. While some western analysts suggest collecting neutral data or building neutral algorithm models as a way to circumvent abuse and discrimination, such recommendations do not resonate in a context of prolonged military occupation. 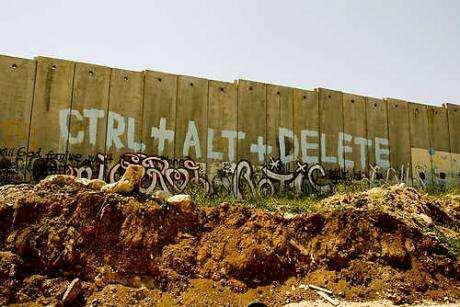 Israel must stop policing the internet to further silence and oppress Palestinians. The detention of Palestinian civilians based on a machine’s prediction and no evidence is yet another instance to be added to Israel’s long list of violations of Palestinian human rights.